We’ve passed the June 21st mark – meaning that summer is officially here! Most parishes have closed out religious education – Holy Communion and Confirmation – and are basking in the afterglow of the RCIA ministry’s sacraments of initiation during Easter Time. Some parishes will host a Vacation Bible School – a great way to intersect with families. Others will take a hiatus before September comes around – unfortunately, many parishes absolve themselves of the ongoing RCIA ministry that should never take a vacation. Speaking of family evangelization, it’s clear to ministers in the evangelization and catechesis field that this is the “name of the game.” Family Evangelization is where much of our attention has to go. Perhaps this summer would be a great chance for catechetical ministers and parish staff to meet and put our collective thinking caps on: if we want to really affect the lives of our families by bringing a more open and lively faith into Catholic households, how can we do this? As mentioned previously, Vacation Bible School is a wonderful way to keep religious education at the forefront year-round and provide busy parents with a welcome respite during the summer months. If your parish has not planned for VBS, perhaps hosting several movie nights during the summer for families or a board game night in the parish hall might be a good idea. Parents with a long summer of time to fill will be grateful for activities to do with their children! We had a great gathering with the catechists at NCCL in St. Louis in May. Shortly after that, the Executive Director of NCCL, our good and dear friend, Lee Nagel, died. He lived with us Paulists in Washington, so his absence is felt very personally and a giant ministerial loss for the Church. Prayers for his eternal life and for his family. In this issue I give a little taste of my summer reading, “Young Catholic America: Emerging Adults in, Out of, and Gone from the Church,” by Christian Smith and his co-authors. I will write a more extensive review of the book and its conclusions in the next newsletter. I also offer for back porch reading a White Paper submitted to NCCL last spring on forgiveness. May God inspire us to be sharers of the Good News this summer. 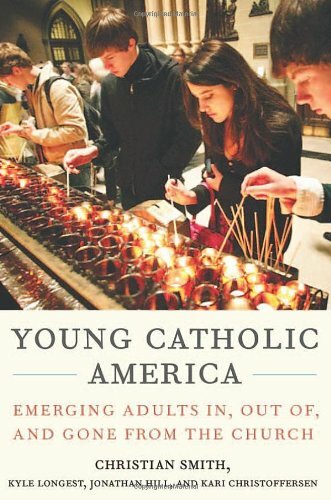 As summer gets underway, I am slowly making my way through Young Catholic America: Emerging Adults in, Out of, and Gone from the Church by Christian Smith, of Notre Dame University, and his co-authors. It makes for sober reading. This book studies young people who have been objects of prior studies; now the prism is “emerging adults” aged 18-25. There is, of course, a ton of data-enough to make any head spin. But the book’s other value is how it contributes detail and color to the great underlying story of religion in our time: how hard it is to implant and nourish faith in our modern culture. We have been wringing our hands over “inactive Catholics,” as well we should, for 30 years. How this term-inactive Catholic-has become more amorphous and complex gets plenty of demonstration in Smith’s book. If there was, at any time in our US/Canadian experience, a clear identity as a Catholic, this identity becomes harder to nail down in modern life. I will look at other aspects of this important book in our next issue of Evangelization Exchange. A recent study from the Pew Research Center which surveyed more than 5,000 Hispanics nationwide found that, “most Hispanics in the United States continue to belong to the Roman Catholic Church. But the Catholic share of the Hispanic population is declining, while rising numbers of Hispanics are Protestant or unaffiliated with any religion. Indeed, nearly one-in-four Hispanic adults (24%) are now former Catholics.” Most of the former Catholics are leaving for evangelical Protestant churches. Because I think our ideas of forgiveness, relating to sin, are severely truncated, I am offering in this short paper a broader, more comprehensive way to think about forgiveness and reconciliation. We almost instinctually think of forgiveness as some kind of reprieve – reprieve from a punishment that we deserve. It’s rather like the image children who disobey their parents, then are told they cannot have pizza and must go to their rooms; but the parents eventually relent and invite the children down for hot slices covered with peperone. With the summer upon us, its a perfect time to plan a Parish Picnic, Backyard BBQ, or Fall Fest! But how will you invite people to this fantastic event you’re planning? Let Neighbors Reaching Neighbors give you all the tools you need from invitations to door hangers to get the word out about your exciting event! As long as we are thinking summer, here’s a great article on sports and faith, and how leadership on the field leads to greater involvement with faith off the field. Click Here to Read about former MLB All-Star Mike Sweeney’s Catholic Baseball Camp. Generations Together: Caring, Praying, Learning, Celebrating, & Serving Faithfully.